Students will be required to use Multi-Factor Authentication (MFA) on some services beginning April 17. For students, MFA will be required to access DukeHub, Box, Sakai, and Outlook Web Access (OWA) to Office 365. They are already required to use it for Duke@Work, the Virtual Private Network (VPN), Virtual Computing Manager (VCM), and Teer Lab machines. For faculty/staff, we will be adding MFA in front of OWA/Office 365 and Time and Attendance, when accessing these sites from off-campus (similar to what we did with Box). Time and Attendance is picking up the requirement due to it being “behind” the same authentication infrastructure as O365 (Microsoft ADFS). If you have any questions, please ask the OIT Service Desk or the IT Security Office. 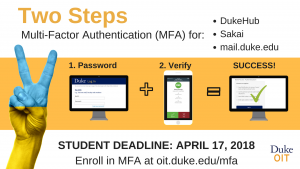 Students will be required to use Multi-Factor Authentication (MFA), or 2-step verification on some services beginning April 17 for added security. MFA will be required to access DukeHub, Box, Sakai, and Outlook Web Access (mail.duke.edu) for Office 365. Students are already required to use it for Duke@Work, the Virtual Private Network (VPN), Virtual Computing Manager (VCM), and Teer Lab machines. Direct communications have begun going out to students about the new requirement from the IT security office. 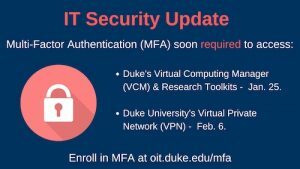 If you have any questions, please ask the OIT Service Desk at 919-684-2200 or the IT Security Office at security.duke.edu. 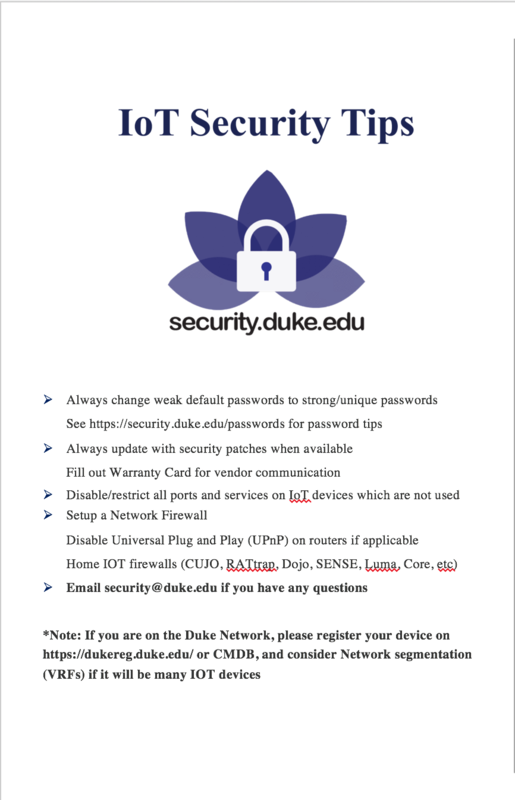 Duke IT Security Office offers tips and resources to protect your identity in this DukeToday article. 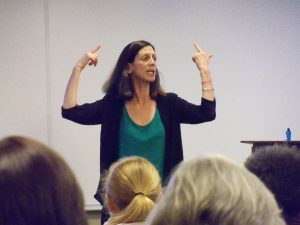 Miss today’s session, “Securing your website at Duke: Best practices for communicators and developers”? Watch a session recording online. Note: You may be prompted to update your MS Silverlight Plug-in to view the recording. 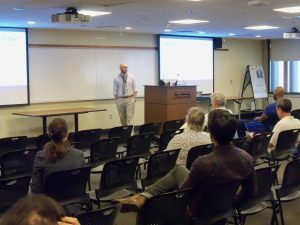 Additional Training: Additional “Securing your website at Duke: Best practices for communicators and developers” training sessions will be held Tuesday, March 27, from 2 to 4 p.m. The Duke University session will be in Perkins 217, and the Duke Health session will be in University Tower 118. Miss today’s Learn IT @ Lunch Session, “Traveling with Technology Panel Discussion”? 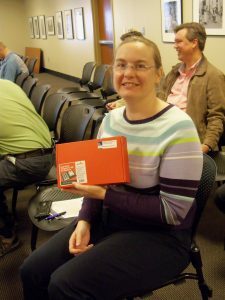 Miss yesterday’s Learn IT @ Lunch session – “Smart Devices Need Smart People: Learn to Be Smart!”? Watch the session recording online. Note: You may be prompted to update your MS Silverlight Plug-in to view the recording. Refer to this IoT Security Demo, a successful repeat of live demo. 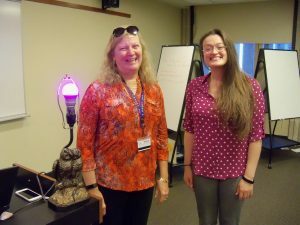 Presenters: Elizabeth Evans (Duke Digital Initiative) with Alyse Zavala (Duke IT Security Office) posing with a “smart” lamp. Missed yesterday’s session “Women in IT: No Lines for the Loo”? Watch the session recording. Note: You may be prompted to update your MS Silverlight Plug-in to view the recording. Also, session slides (PDF) are available. Our presenter, Cathy Hubbs (CISO, American University) engaging with the attendees. Miss yesterday’s Learn IT @ Lunch session – “‘Be Mindful!’ IT Security Tips for Work & Home”? Watch the session recording online. Note: You may be prompted to update your MS Silverlight Plug-in to view the recording. Also, session slides (PDF) and Stay Secure Online Tips are available.